While banks and certain small savings schemes issue a passbook, Mutual Funds do not issue a passbook, they issue an Account Statement instead. The main purpose of a passbook is to keep track of all transactions with a bank: deposit, withdrawals, credit of interest etc. In a Mutual Fund scheme too, similar transactions could be there: purchase, redemptions, switches, reinvestment of dividend etc. 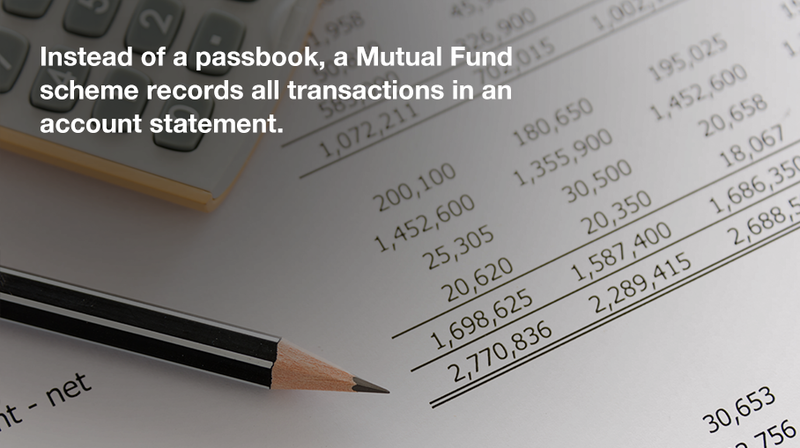 In a Mutual Fund scheme, such transactions are captured in the account statement. An account statement is issued after the first investment in a scheme is made. The account statement would reflect all relevant details: Investor name, address, details of joint holding, amount invested, NAV details, units allotted etc. Every time a new transaction is made, the account statement would be updated and a copy is mailed to the investor. In this digital era, many investors opt for e-statements, which is more convenient way to read, access and store information. Investors can at any time access and avail a duplicate account statement by contacting the Asset Management Companies (AMC) or its Registrar. The scheme account statement thus plays the role of a passbook.